Hi, kitties, I'm new here. I have noticed that while we have posts about torties, orange and black kitties, there are none about us classically beautiful calicos! So, show yourselves! I want to see!! Hi, I'm Shiloh and I love being a unique calico. Hello, my name is Callie also. They call me a calico, although I think I'm just a regular kitten. I love that there are other cats that look kind of like me. Here I am! Dad says I'm the cat where tortie and calico meet. Hello my name is Sassy, Iam a beautiful long haired calico waiting at the Rainbow Bridge with my sister Pepper. Mom loves calico and long haired cats. Actually Mom loves any kind of cat. My sister, Pepper, and I love to make new friends so feel free to invite us any time. PURRRRRRRS and KISSES! from the Bridge. I am a BEAUTIFUL CALICO! Another calico Angel from Rainbow Bridge. Kitty kisses to all! Hello. I'm brand new to catster even though most of my family members have been here a while. Thought I'd stop by and say hi! 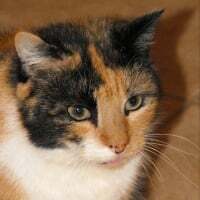 Hello, I'm a calico kitty, I will be two in December, I have slight brain damage and I don't walk like a normal kitty, I also trip over my paws a lot and I can't jump very high. I love being a calico kitty, Yea for us. Wow, what a suprise to see this! It\'s such an old thread and it didn\'t even get a lot of replies when it was new. I never dreamed I\'d get a reply again. Welcome to catster, Mouse, Flick and Sydney. Calicos rock! Hey Gals! Thanks for the welcome! If I didnt say before, I am Sweetie, Lemur & family newest member! Oh wow! A thread just for us calico kitties. I'm pretty new in the neighborhood and the youngest in my family. Some of them play with me and some ignore me but THE KID is the most fun cuz she likes to dangle wiggly things just for me to chase. Hi! I'm Stitch. Us calicos are too hot to handle! Hi there!! Did someone call? I\'m a calico too!!!! I love being a calico. Hee hee! Sydney & kittens you guys crack me up! Hi all you other beautiful callis. I\'m new here although most of my family has been on for a few months. Hey Calli girl - same for me. I'm new but my fam has been here a while. Did you see my kittens? Awwwwwwww you're just as cute as can be!! With those markings you could go to the tortie group too!!! Very cute! Hi! I'm a calico too! I have herpes in my right eye but I generally try to look nice for the camera. I got it when I was born and my mama does what she can to make me feel better. How is everyone? Do all calicos have green eyes? Hi my name is Miss Kitty. Mom calls me Lover Girl. When her and dad got me my name was just simply Kitty. They were told all kinds of things about me from my previous people but they quickly figured out none of it is true. My previous people even tried saying I don't like getting attention.....well after being here for just over 2 days I jumped right up in moms lap and just laid there purring up a storm with her petting me. They were also told I'm in indoor/outdoor cat.....I hate going outside it's soooooooo scary out there :0( My new mom and dad let me stay inside where I fell safe. Hi sistah Sydney! My eyes are very much a golden yellow.